Whether you're new to running or you've been running for years, you can benefit from strength training. Some runners are hesitant to strength train because they think it will make them bulky and slower. But strength-training can make your running program more effective and more enjoyable. Whether you're looking to get faster or lose weight, you can benefit from doing some strength training. Here are some ways that strength training can enhance your running program. If you've ever had a long run or race when your form fell apart as you get fatigued towards the end, you'll definitely benefit from strength-training. Strengthening your core can help improve and maintain your running form, which translates into greater running efficiency. This is especially important for those training for a long-distance event such as a half or full marathon since small improvements in efficiency can make a huge difference over all those miles. Adding more lean muscle mass will increase your metabolism, which means you'll burn more calories both at rest and during workouts. Many runners find that adding strength-training to their training regimen boosts their weight loss effort and helps them bust through a weight-loss plateau. Strength training helps your body better deal with the stresses of running. Your muscles will be able to perform longer before getting fatigued, which will help you maintain your proper running form. Improving your strength will help you fight off hitting the wall or cramping up during the late stages of a long-distance race. Improving your form and endurance also translates into a faster overall pace. Runners usually see improvements in their race times fairly soon after they add strength training to their regimens. You don't need to spend hours doing strengthening exercises. Even just two or three 15- to 20-minute strength-training sessions a week can build more lean muscle mass. Lower body and core exercises are particularly important when it comes to reducing injury risk. Stronger core and leg muscles mean that you'll maintain your proper running form longer, so you'll reduce your risk of lower back pain or other issues that are associated with bad running form. Many running injuries, especially knee and hip-related issues, are a result of muscle imbalances or weaknesses. If you're feeling pain or are worried about a biomechanical flaw or previous injury, a sports doctor or physical therapist can recommend specific exercises for you to target certain areas. Beyond the benefit of avoiding pain, not getting injured also means that you'll stay motivated to keep running and be more likely to build a consistent running habit and keep progressing as a runner. Running gets more enjoyable when it starts to feel easier. This happens at a different times for different runners, but adding strength training to your routine can definitely speed up the process. Strengthening your leg muscles will help increase your endurance, meaning you can run longer without feeling fatigued. Beginners may want to alternate their days of running and strength training so they're not doing them on the same day. There are different types of strength training and not all of them are the best choice for runners. For example, power lifting involves training so that you can lift large volumes of weight for a duration of 1-3 reps. This kind of training generally produces large muscle mass gains (hypertrtophy) and may not be the smartest approach for a runner who wants to remain lean. Not all forms of strength training are recommended for runners. Programs that involve body weight exercises, functional training, and endurance strength training are best suited for those whose primary goal is improved running performance. Endurance strength training focuses on improving muscular endurance by lifting less weight and performing more repetitions. When you participate in this type of weight lifting you lift approximately 70 percent of your one rep max and complete 12-20 reps. You might complete 1-3 sets of each exercise. Body weight training is also important for runners. Functional training exercises such as the lunge or a single leg squat require the large muscles in your body to work together in the same way that they need to during other daily activities, such as running. These exercises improve balance, coordination, and movement efficiency—skills that will improve your running gait and overall performance. Functional training can also reduce your risk of injury. Researchers have found that strength training programs that include plyometrics can improve running efficiency and speed. Plyometrics are movements that involve jumping or other quick bursts of explosive movement. Squat jumps, lunge jumps, and box jumps are examples of plyometrics. There are different ways to choose a weight training program. But if your goal is to improve your running performance, then you should choose a training program that aligns with your fitness level to minimize the risk of injury. Endurance strength training and functional training are good choices for anyone at any fitness level. Almost every exercise can be modified for beginning to advanced level exercisers. Plyometrics, however, are generally more advanced movements and involve slightly more risk. While they can provide benefits, these exercises are best suited for those with more experience. Lastly, take access into account. 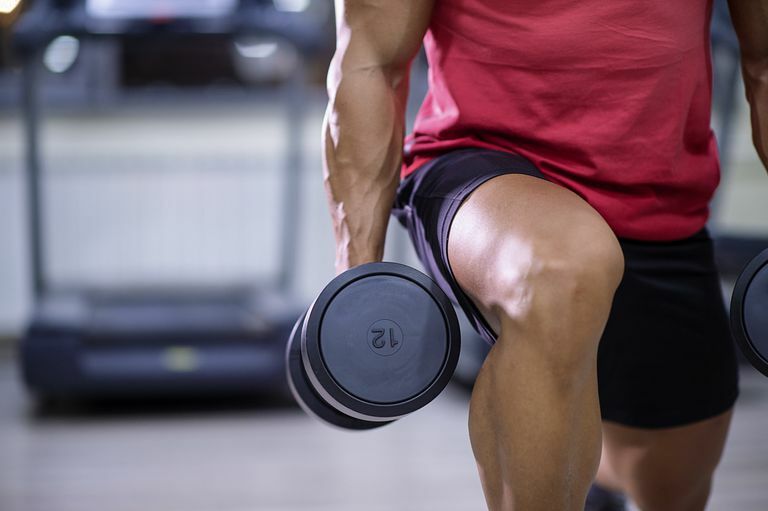 If you can't get to the gym on a regular basis or if you don't have weights at home, then endurance training with weights may not be the best choice. However, body weight exercises can be performed anywhere with little to no equipment. Research into the benefits of strength training for runners has determined that a regular program is necessary to see results. Daily exercise is not required, but training more than once per week is recommended. Authors of a large research review concluded that weight training 2-3 times per week for 8-12 weeks will produce optimal results for runners. Of course, this requires that you balance your training schedule so that you have time to run and time to hit the weight room. If you don't run every day, weight training on your off days is a smart approach. While it is important to allow your muscles to rest, endurance strength training does not tax your muscles in the same way that power lifting and other forms of weight lifting will do. In addition, most endurance training and functional training exercises help you to increase range of motion in joints which will enhance the recovery process. Another option is to incorporate core strength and functional exercises at the end of your runs. For example, you can complete five minute of plank exercise, a few lunge variations, and some single leg squats when you finish your running workout and before you stretch. There is no right or wrong way to add strength training to your schedule but keep consistency in mind. To maximize the effects of strength training choose a program that you can complete regularly. One of the most common mistakes that runners make when adding strength training to their schedule is doing too much too soon. Many runners have a competitive mindset that can lead them to take on more weight or more advanced exercises with disasterous results. Remember that the goal of your program is to become a stronger runner. Getting competitive in the weight room (lifting too much weight, doing too many reps) can lead to injury and exhaustion—and days away from running. Another common mistake is irregular training. If you commit to a substantial weight training program but only complete the program once every few weeks, it is not likely to have any impact on your running. In fact, it may even put you at risk for injury. Instead, consider starting small and building slowly. Commit to 15-20 minutes on your off days or at the end of your runs. Complete the workouts consistently and add more training if time allows. Upper body exercises: Tricep dip, tricep overhead extension, overhead shoulder press, pushup​. Choose a few basic exercises to begin. Then complete your program consistently to reduce your risk for injury and enjoy a better running experience.